As a young boy, I was always been fascinated by military history. I had toy soldiers of all kinds: Civil War, World War II, Revolutionary War, and even the Knights of the Round Table. I used to buy the toy soldiers from the Marvel Comic books that I read as a kid (if I had kept my more than four hundred comic books from the sixties, including some first editions, I would be a rich man). The ones that I played with the most was my Gettysburg set! I also saw movies about those same wars and movies about the Romans, Greeks, Trojans, and Vikings. I watched the Gray Ghost on television, a series about Confederate Colonel John S. Mosby, in the 50’s. I really enjoyed a couple of Civil War movies and still watch them to this day: Gone with the Wind, Horse Soldiers and How the West Was Won. I have been visiting Civil War battlefields in the Eastern Theater since I was six years old, starting with Fredericksburg. However, it was after my fourth-grade visit to Gettysburg that I began reading and collecting Civil War books. During my long banking career, I spent many vacations visiting the battlefields at Gettysburg, Fredericksburg, Chancellorsville, Antietam, Wilderness, Spotsylvania Court House, Richmond, Petersburg, Bull Run, and Monocacy. I used to dream of being on a Civil War battlefield, sometimes fighting or most of the time being an overhead observer. I wondered how the soldiers felt while fighting, killing, marching, and being wounded. In fact, many of my bank associates told me that I should become a reenactor and wear the blue uniform. However, I never thought of being a living historian until I experienced three events, the movie Glory, the mini-series Roots, and the Battle of Fort Stephens reenactment in 1994 in Washington, D.C. I saw and met some of the soldiers of the 54th Massachusetts Infantry Company B! Some of the men had been in Glory and I spent some time talking with one of the guys who was a Marine (unfortunately, I have forgotten his name). He told me all about being a black Civil War living historian and I really wanted to join the 54th at that point. However, the demands of my job would not permit it at the time. On one of my visits to the Richmond Battlefield in 1998 or 1999, I went to Cold Harbor. An elderly white volunteer guided me around the entire battlefield and told me stories of the soldiers and their descendants. One story was about a black man who wanted to know where a white general from South Carolina was during the battle. The volunteer asked him why he was interested in that general. 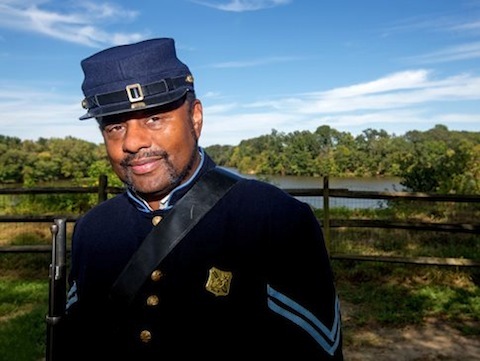 The man said that the general was his great grandfather, so the volunteer told me that he never asked another black person about why they visited the battlefields. I am glad that he had that encounter—and that I had my encounter with him—because after my visit, I was determined to volunteer at a National Park Service Civil War battlefield. On this same trip, I visited the site of the New Market Heights battle, where fourteen colored soldiers and two of their white officers earned the Medal of Honor, and afterward, General Benjamin Butler had Tiffany and Company cast the “Butler Medal” for his colored soldiers that he said were slighted by not receiving Medals of Honor. I visited Petersburg Battlefield as well and saw a monument dedicated to the United States Colored Troops who fought there. I saw the Five Forks Battlefield, where the V Corps broke General Pickett’s line and where General Sheridan relieved General Warren from command (even though Warren fought very well there –on that day). All of these experiences helped me decide to become a Volunteer at the Fredericksburg and Spotsylvania National Military Park. My retirement date from SunTrust Bank was on January 18, 2005, and in February of 2005, I became a park volunteer. So, I was now a volunteer historian who thought I knew all about the Civil War—until I met Frank O’Reilly, Greg Mertz, and Kris White. I spent a lot of time asking them questions, getting recommendations about books to read, and going on their tours. My Civil War library went from about 100 books to 700 books in the eight years that I have been at the park. Acquiring paintings, CDs, DVDs, and even VHS tapes assisted me in my quest to become a much better Civil War historian, too. However, I did not think that I was ready to give tours of the battlefields. I was comfortable talking with people one on one or in small groups, but not with leading tours. From my first volunteer days at the Park, I became friends with a seasonal ranger/historian named Richard Chapman, who had been a former actor. We became friends very quickly, so I went on many of his battlefield tours. So many people were impressed with his storytelling that the visitors loved him! He would give me pointers, and we would talk about battles, brigades, and individual soldiers. Then one summer day in 2006, I went on a tour with a new seasonal, and I was able to assist him with his tour. That gave me the confidence to become a seasonal historian myself. In 2007, I became a seasonal ranger/historian. I also became a sales associate at the battlefield bookstores. Tom Breen is the manager of the bookstores, and he asked me to help him out at the store; since he is a friend and a very knowledgeable historian, I went to work for the bookstore. We have had many great Civil War discussions and I got the chance to read Civil War books during the slow seasons. Next: Delving into the history of African-American soliders…. This entry was posted in Common Soldier, Ties to the War, USCT and tagged Henderson-memoir, Steward Henderson, United States Colored Troops, USCT. Bookmark the permalink. Fascinating story! Looking forward to next chapter. I can’t wait until we get part #2! This is awesome Steward……..
Great story, thanks for sharing. I’m looking forward to part two. This Summer, I will be making my first visit to Gettysburg. I want to do this as well as i am about to retire from the Army and want to be a part of that always on a historical perspective. Thank you all for your comments. Janine, it has been my great pleasure to work with you and Paul. I guess that I will see you both at Fort Ward on this Saturday. David, please contact me at stewardhenderson@yahoo.com. Depending on which part of the country that you live in, I may be able to get you in contact with a unit.